Since Ari entered our lives, I have seen the best in people revealed. On the other hand, I have also seen the worst. It is unfortunately much easier to focus on the situations that make you sad and disappointed in humanity; The woman staring (without smiling) at your child, the comments made on social media, the “r” word being thrown around you carelessly, the stories of people saying terrible things about “those children.” So tonight, when all I want to do is cry over hearing such a story, I am going to focus on the positive things that have happened lately instead. 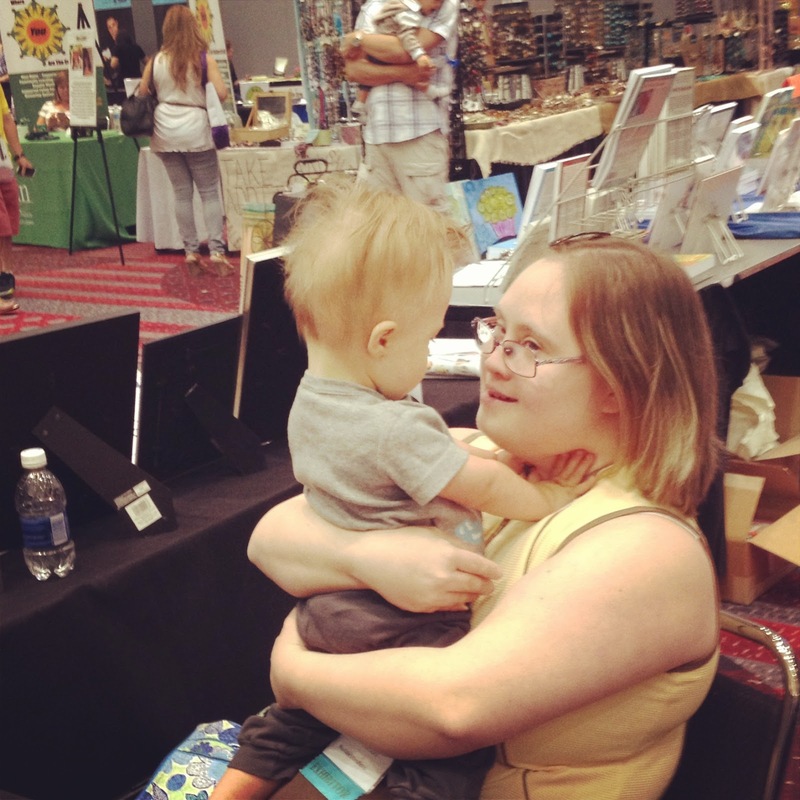 I will start by telling you about the wonderful opportunity I had to attend the National Down Syndrome Congress Annual Convention. A great friend flew into town to support our family and help out where she could. We were able to attend workshops to better educate ourselves on the vast array of topics regarding parenting a child with Down syndrome. I think, however, that we got the most out of the social aspect of the weekend. Upon arrival on Friday evening, I felt a gush of love and pride seeing the convention center and surrounding area filled with others like us, many who have been on this journey for a long time. I felt like we were getting to meet our new family in a way. Seeing all these individuals and families walking on the streets downtown, it felt like we were the “norm;” not the minority. It was quite amazing. We were able to socialize with many other families and even got to meet (in real life) some of our friends from Instagram. If I haven’t mentioned it before, my Instagram community is my second family and I am so grateful to have them all on this journey with us! Tim enjoyed getting to talk with parents whose kids were a bit older than Ari, so he could get a better picture of what was ahead for Ari. Probably my favorite part of the weekend was the big dance on Friday night. My friend and I danced and mingled and I teared up every 2 minutes. 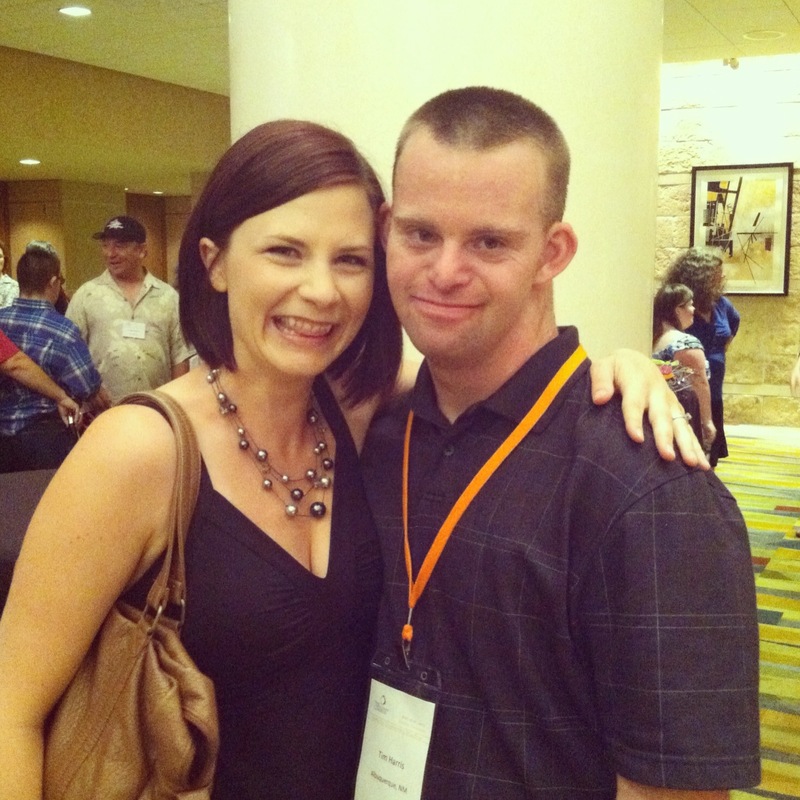 I looked around and I saw kids and young adults with Down syndrome who were so happy to see each other, and I saw young couples slow dancing and imagined that some of them hadn’t seen each other since last year’s convention. There was even a proposal at one point!! A young man that we were dancing with started clapping and cheering excitedly at the start of a new song. It was Britney Spears, who he LOVES!!! The DJ spinning the tunes? Yeah, he also has Down syndrome and he’s awesome. I looked around me and I saw Ari’s future. His beautiful, joyful, amazing future and I was overjoyed. I was excited to get a hug from Tim Harris of Tim's Place! The next weekend we took a long road trip up to South Dakota for the wedding of some dear friends and stopped many times along the way, mainly to give the little man a break to stretch his legs. Once in a grocery store, once at Wall Drug, and once in a cafe, we had people come up to us to tell us how awesome/cute/wonderful our baby was. 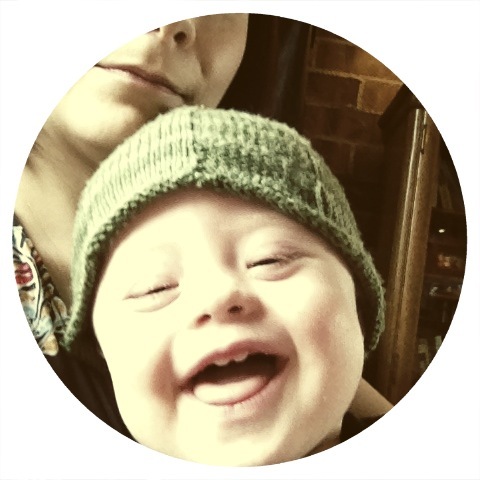 They all had some connection to Down syndrome and made it a point to let us know that they saw beauty where others might see something strange and different. It means a lot to have those encounters. Hi! My name is Wendy and I am fortunate enough to be mother to Oliver. He has just celebrated his 17th birthday. It is so very simple my dear lady - enjoy and value every moment of this incredible journey you are now on. Your son will be AMAZING and you will have a tie which connects your heart to his with an invisible yet unbreakable thread. Difficult to describe. I have two children, as well as Oliver I have a daughter Anna, now 25 and who was 8 when my son was born. I love my children with every piece of my heart and equally. I would lay down my life or walk through fire for either of them without a moments hesitation. The connection I have with Oliver however goes deeper, right down to the depths of my very soul. I can't describe it any better than that. Maybe one day you too will understand that. Please have a look at www.facebook.com/OliverHellowellPhotographer and also www.oliverhellowell.com and be enthused, encouraged and inspired by my boy and his achievements. You are still early on in the journey with your firstborn and so may still be harbouring doubts and fears. Please try to both be gentle with yourself - (you are after all only human!) as well as strong and enthusiastic about your son's future because trust me - you will be so so very very proud! Best wishes and love, Wendy. Well, this made me cry in the best way. I am so grateful for parents like Wendy who are paving the way for our children. If you are a parent and have wisdom to share with us newbies, please do so! It is very uplifting and reassuring for us. And, everyone, go check out Oliver’s work. What a talented young man! He is such an inspiration! There are more good things happening than negative things if we just keep our eyes open to them! Have a happy day! Your son is absolutely ADORABLE! Cuteness overload for me tonight :) I read your story on Birth Without Fear, and followed your comment here. Amazing story, I love the way you write with such honesty.